While Wednesday will be warm and sunny, conditions will be very different by the end of the week. Rain, sunshine, clouds, snow. Light winds, stiff winds, brisk winds, gusty winds. Warm temps, cool temps, cold temps, frigid temps. You name it, we've got it in the forecast! And that's just the next 48 hours! We're waking up to mild temperatures on this Wednesday morning, with one more round of showers pushing through the state. Raindrops will come to an end by 10 a.m. Wednesday, at the latest. Bright sunshine should take over the skies by lunchtime. With high temperatures in the lower 60s for most of the state, we'll end up about 10 to 15 degrees above normal for early March. There's no contest — Wednesday will turn into the nicest day of the week. Winds will be a bit gusty at times on Wednesday, perhaps as high as 40 mph through the afternoon hours. Other than a stiff breeze, Wednesday night will be quiet. Clear skies will lead to cool temperatures, bottom out near 40 degrees by Thursday morning. Technically, a cold front will begin to push temperatures cooler on Thursday. 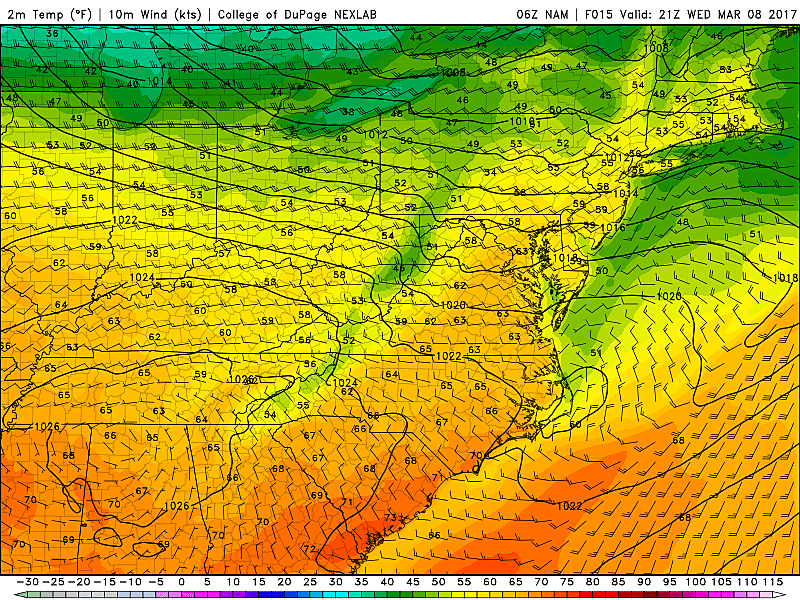 You'll notice the continuing wind gusts, but I think thermometers will still make a run for the mid to upper 50s. (Maybe even 60 degrees in South Jersey, for the third day in a row.) Thursday will be dry. Clouds will increase Thursday evening, and a shortwave storm system will arrive as early as 10 p.m. Thursday night. 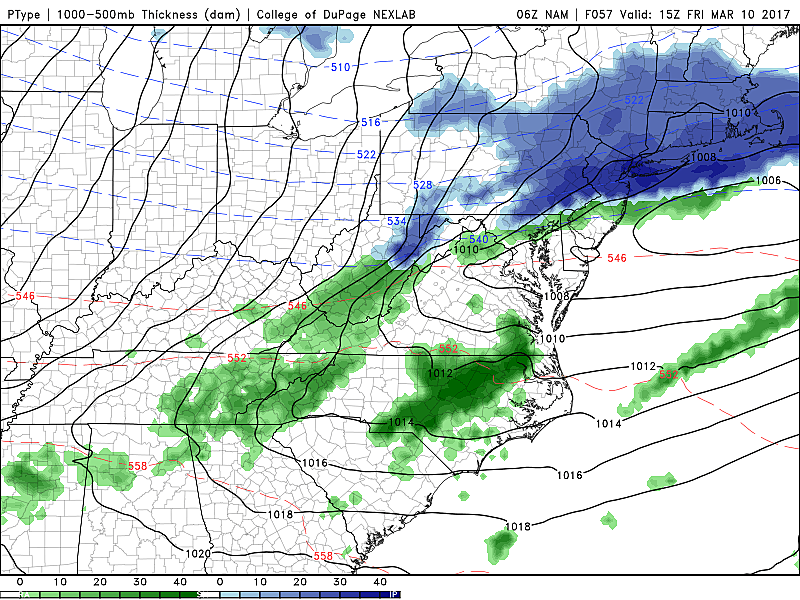 That storm is likely to produce accumulating snow across most of New Jersey. As a storm system moves from west to east across the Garden State, we'll see a chance for snow through about midday Friday. (There could be some rain and/or mixing, but I suspect this will be mostly snow.) While snowfall isn't expected to be truly "heavy," we could see some healthy accumulations along the storm's path. Models have settled on 2 to 4 inches of snow accumulation across North Jersey, defined as along and above Interstate 78. That's right on the threshold for snow-induced travel problems. Central Jersey, between Interstates 78 and 195, will see a bit less, on the order of an inch or two. South Jersey is currently expected to see almost nothing. Honestly, I am unimpressed by this storm system. So, I'm leaning toward the lower end of each of those snow total ranges. And I've opted not to craft a specific snow forecast map at this time. We'll see how subsequent model runs play out, but I doubt forecast snow totals will go up significantly. Would I be surprised to see a Winter Weather Advisory for part of New Jersey for early Friday? Not at all. Do I expect minor traffic headaches? Sure. Is this going to be a crippling blizzard? No way. If you follow my blog regularly, you know we have been carefully tracking a storm system that had the potential to hit New Jersey in the Saturday night-Sunday time frame. 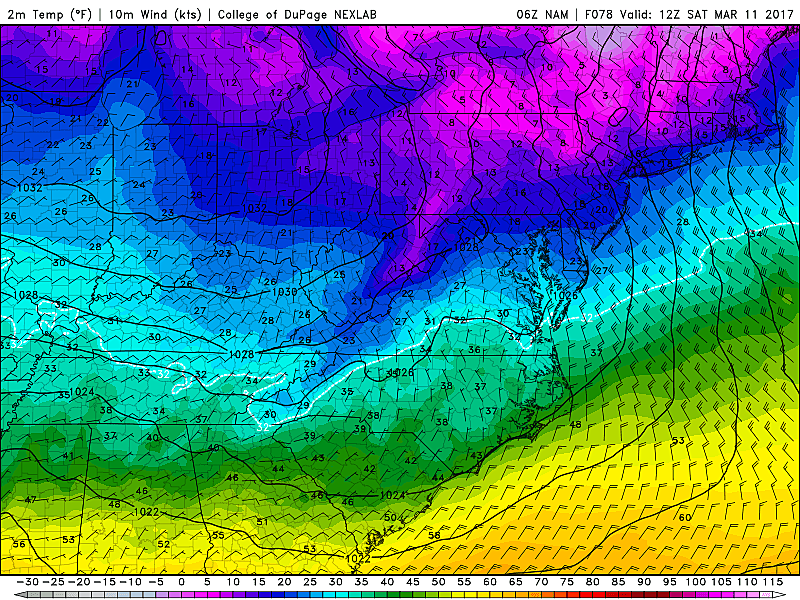 Model temperatures have since trended colder, and the track of this storm has gravitated further south. While Virginia and North Carolina will probably get walloped by big snow totals, New Jersey now comfortably falls outside of the "bullseye" for this storm. I think we could still see an inch or two in far South Jersey (below the Atlantic City Expressway), but we are right on the edge between nothing and hardly-nothing. 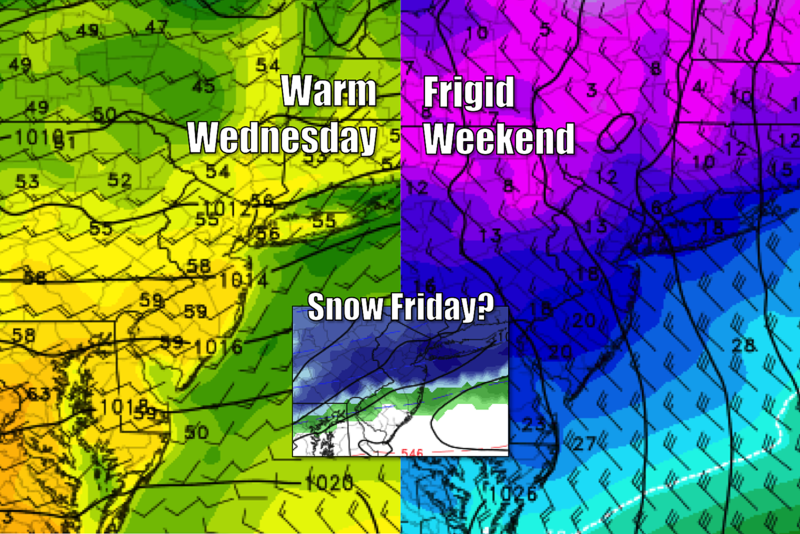 Could this forecast evolve, flip-flopping back toward New Jersey? Yup. But confidence is growing that it won't. We'll be watching, nonetheless. 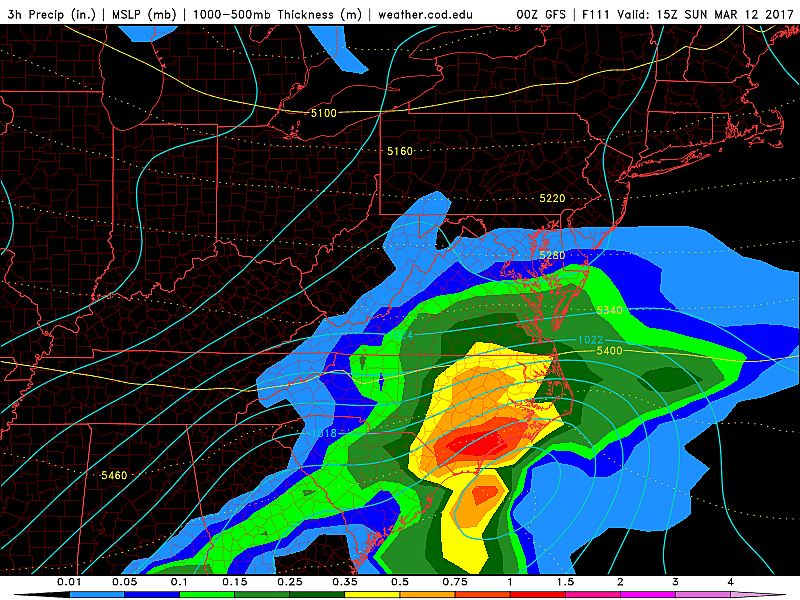 Another potential winter storm is modeled to be in New Jersey's neighborhood around for next Tuesday (3/14). Still way too early for any detail. Just know we're watching it. Don't let these meager snow chances distract you from the main headline of this forecast. It is going to become very cold again, as we approach the second weekend of March. Thermometers will climb into the mid to upper 30s for early next week, but that's still uncomfortably wintry. The earliest we could see a substantial warmup will be late next week.